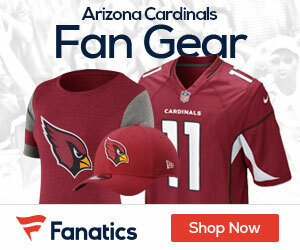 Listen up Cardinals fans: you can now get all of your Arizona Cardinals gear at winning prices at Old Navy! There are only a few more days till the season kicks off so it’s time to head to Old Navy to stock up on gear for the season. Men’s tees, fleeces and hats accompany women’s and kids’ apparel to outfit the entire family from head to toe, all for as low as $14.94. Super-fans can also find fun accessories to make their tailgate parties and game day experiences even more fanatical – koozies, bottle openers, tattoos, lanyards, and ping pong balls are available for as low as $5.50! Whether you’re at the stadium, in the parking lot, in your own backyard or in front of the TV, Old Navy has everything you need get kick the Cardinals season off in the right fashion. 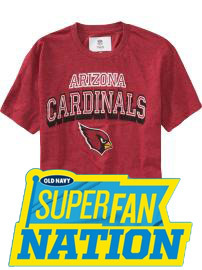 Head to your local Old Navy store’s Superfan Nation section to be a true fanatic and show your team support! You can find your local store here.